This Bread Theme Resource Packet was inspired by how much our preschoolers love to cook...and PRETEND to cook! Children love to set up restaurants in the dramatic play center and this free packet will help you to do that and more! Don't forget to check out the Bread Theme page for many, many more free activities and lesson plans! This might also be a great supplement for a Friendship Theme or a Thanksgiving Theme! 15 Page digital packet with activities and games for your preschool classroom! 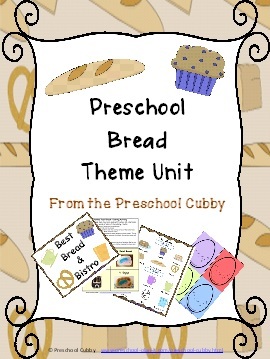 This Bread Preschool Theme Resource Pack has 15 pages of activities to supplement a week (or 2 week) long theme! A Corresponding Order Form for your Preschool Bistro Servers to take orders on! A Decorated blank menu to fill your own foods onto. Go to The Preschool Plan It Store Main Page to see more resources that are available!